Following the fire that destroyed the lodge at Dancing Bear, a new one arose, this time with no rooms, but housing Appalachian Bistro, one of the top dining destinations in Blount County, Tenn., and run by the former chef at Terra Mae in Chattanooga. Hammocks and a firepit are in front of the restaurant. › Where: 7140 East Lamar Alexander Parkway, Townsend, Tenn.
› Where: 4366 Butterfly Gap Road, Maryville, Tenn. The Smokies come alive this time of year as tourists flock by the thousands to see Mother Nature in her glory — the changing of the leaves from green to brilliant shades of reds, yellows and golds to mountain wildlife as it clings to the last warmth of the year before creeping into the shadows for the winter. It's a moment of celebration and, for those looking for a place to rest their heads after a day of seeing all the sights to behold, there are inns off the beaten track that offer more than a good night's sleep. Two in particular have an interesting story to tell. By car, they are no more than 30 minutes away from each other; by what they offer, however, they are miles apart. One offers dining options, the other breakfast only. One is at the front door of the Great Smoky Mountains and is ideal for families and pets. The other is an adults-only destination in the foothills of the Smokies with a no-pet policy. But they are alike in one way. They both offer opportunities to experience the geologic diversity of Blount County, one Tennessee's most scenic areas. Keep in mind, however, all hotels and resorts are packed during fall leaf season. The best chance of booking a room is to be flexible and try for weeknight reservations. Or book now for next season. Winter also is an easier time to secure a room. It's also one of the prettiest times of year when the mountains may be wearing their winter whites. Rates are seasonal at both resorts. In 2014, Mark and Sharon Oldham, former owners of Chattanooga's StoneFort Inn, which recently was renamed the Dwell Hotel, purchased Dancing Bear Lodge. Located in Townsend, Tenn., the inn is just minutes from the entrance to Great Smoky Mountains National Park. "A lot of people don't know about Townsend," says Mark Oldham, a 1978 graduate of McCallie School. "It's a little slice of heaven. "I've always been interested in the hotel business," says Oldham, the former owner of Uniguest, a company that publishes maps and guides for hotels around the world. The couple sold the StoneFort the same year they bought Dancing Bear, which had burned to the ground the year before. But like a phoenix from the ashes, it was rebuilt by the Oldhams. 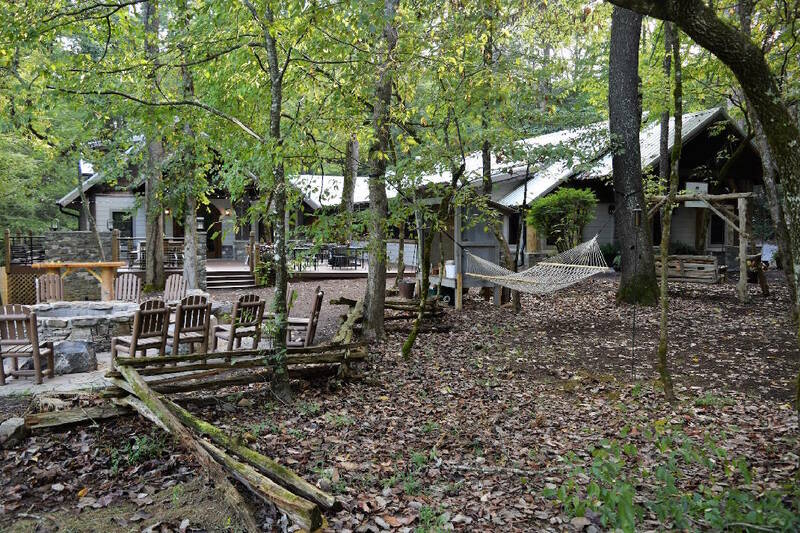 Sitting on 36 acres, Dancing Bear steps to the music of the mountains. Taking cues from its surroundings, each of the 18 one- and two-bedroom, Wi-Fi-enabled log cabins has rustic appeal, featuring porches complete with rocking chairs and porch swings. Sounds from a nearby creek add to the ambiance. The Oldhams' future plans call for the addition of a new inn with 10 to 16 rooms, followed by a new spa and pool. The plan is, when complete, Dancing Bear will be a full-service resort. Dining at the lodge offers a couple of options. For casual meals, the Apple Valley Cafe, famous for fried apple pies, serves breakfast, lunch and dinner. Enjoy a breakfast burrito with a cup of coffee brewed from beans roasted nearby, or a Cafe Burger and cold beer for lunch or dinner. A large board near the entrance lists the daily offerings. Appalachian Bistro, located on site and newly rebuilt following a devastating fire that destroyed the original Dancing Bear Lodge in 2013, is a complete event center and gourmet restaurant, the latter under the direction of Executive Chef Shelley Cooper. Her name may sound familiar because she was chef at Terra Mae Restaurant in the StoneFort Inn. She followed the Oldhams to Townsend and has now created a menu that mirrors many ingredients and cooking styles indigenous to the Appalachian region, where her father was born and raised. Her passion is to create "a version of highbrow Appalachian fare," she says. To that end, she has created dishes such as Braised Beef Short Ribs with Pimento Cheese Grits and Buttermilk-Brined Chicken with Shrimp Crayfish and Tomato Gravy. On the Dancing Bear property there are bikes, complimentary to guests, and plenty of trails to ride. There's also a fitness center and retail shopping for souvenirs, freshly made fudge and regional art from a new gallery at Dancing Bear's sister property, Apple Valley, located adjacent to the resort. Nearby, fly fishing can be experienced on Little River, along with tubing through its rapids. Or take a leisurely drive through the picturesque, often-photographed Cade's Cove, just a short drive away. When Realtors Becky and Mike Johnson listed the 1,000-plus acre property southeast of Maryville, Tenn., they had no intention of keeping it for themselves. But the couple saw its potential so they dug a 32-foot-deep lake and built rental cabins — each on five acres of land providing privacy. The idea of a bed-and-breakfast wasn't in the plan but, as the project evolved, a need for offering guests some sort of food service was evident. Although the closest grocery store is only about 20 minutes away, most first-timers didn't realize and did not come prepared. "Everyone was coming without groceries, so we decided to offer breakfast," Becky Johnson says. But not in the typical bed-and-breakfast style. Rather than guests leaving their cabins to gather together in one dining room, breakfast is delivered to each cabin at a set time every morning. Running Butterfly Gap Retreat with her children, Mandy Sitzlar and Laura Lockwood and husband Ryan, Becky says, "I've had the best life ever, being able to work with my girls" as she sets thick, fluffy blueberry pancakes on the breakfast table with carafes of milk and orange juice. Butterfly Gap Retreat was recently selected by bedandbreakfast.com as one of the Top 10 modern bed-and-breakfasts in the world. The cabins, designed by Maryville architect Gary Best, Becky's brother, are all of different design, some crafted from wood, some glass. Most are on the ground, though one, known as the Tree House, is perched in the trees. They are little houses that make the most of their diminutive size, with clever central walls disguising closeted toilets and other bedroom/bathroom accoutrements. There is one handicap-accessible house, every aspect of which is wheelchair accessible. All cabins are equipped with full kitchens and are one bedroom, though a couple have lofts with an extra bed. But with only one bathroom, they are more suited to a single couple. "Just be prepared," Sitzlar advises. "Out here, it's gravel roads and grass. Bring groceries. Maybe a bottle of wine. So many people who come here don't leave once they're here. They come here to veg out. Decompress." On-site activities include fishing in the lake, boating — bring your own canoe or kayak — and swimming. There are miles of clearly marked hiking trails, as well as your pick of places to lie back with a good book and enjoy the views. Wi-Fi is only available in and around the main office. So if you need to catch up on your email or just can't take a break from social media, there are places to sit with a view of the lake and keep in touch with the outside world. Cell phone coverage is sketchy at best. The retreat is so remote, Google maps won't get you there. Log onto Butterfly Gap's web site for directions.